Home Office 365 PowerShell SharePoint Online SharePoint Online Management Shell SharePoint Online: How to Remove External Users using PowerShell? SharePoint Online: How to Remove External Users using PowerShell? How to Remove External User from SharePoint Online? 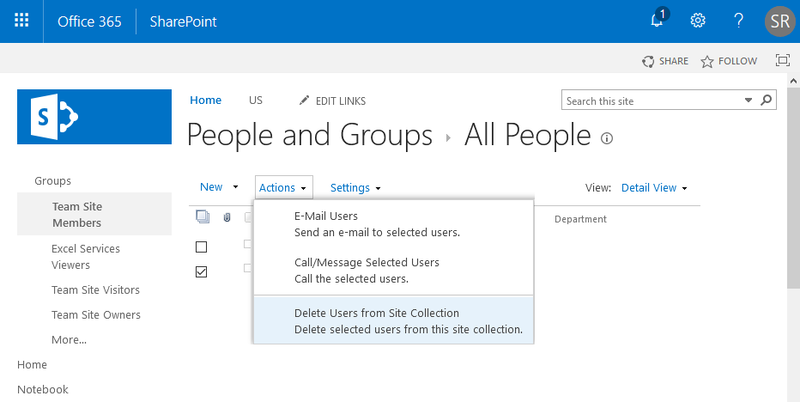 To remove an external user from SharePoint Online, we've to delete them from both site collection permissions and at Office 365 tenant levels. This removes the external user from SharePoint Online tenant. However, it leaves "User Information List" intact. So, We'll have to use Get-SPOUser and Remove-SPOUser cmdlets to completely delete the external user. Confirm the prompt once to remove the external user from SharePoint Online. This removes the external user from the particular site collection. This step can be done with below PowerShell as well. Make a note of the User IDs returned. Get the external user's Id listed above and run the Remove-SPOUser cmdlet to remove the external user from SharePoint Online site collection. How about deleting all external users in all site collections after you disabled external sharing at tenant level? Well, In order to remove an external user from SharePoint Online, we've to delete them from both site collection permissions and Office 365 tenant levels. Write-host -f Green "External User $($ExtUser.LoginName) has been removed from site collection"
Write-host -f Green "External User $($ExtUser.LoginName) has been removed from the tenant!" Please note: You may have to clear browser cache, in case you could still find the removed external users in places like People Picker!